I'm planning a 3-day trip to Paris in May, so I've been rummaging through the archives looking at photos from previous trips. 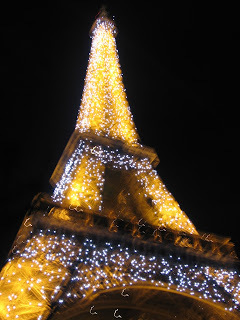 I took this image of the Eiffel Tower on my very first trip to Paris in 2005. Yes, I did the very touristy night boat ride on the Seine accompanied by the 'Paris Illuminations' tour. Worth every penny and one of those tourist things that everyone should do. I've actually done it more than once. There's nothing so beautiful as Paris at night! It's fun to have been to Paris enough times now that I don't feel compelled to visit every museum or monument each time. This time I've got a 4 hour session booked with a street photographer learning how to 'see' what I photograph and also a walking tour of literary Paris to visit some of the haunts of my favorite writers like Hemingway and F. Scott Fitzgerald. I'll also be taking a peek into the lives of some of Paris' more unusual characters like Gertrude Stein, Sylvia Beach and James Joyce. I'll definitely stop by Notre Dame...a girl only celebrates her 850th birthday once, you know. And maybe take in the Marc Chagall exhibition in one of my favorite venues...the Musee du Luxembourg. And the best part? I'll be meeting up with old friends from the States! Should be a fun 3 days.